In this post I will tell you a secret of how you can get a free discount coupon while recharging your mobile phone. You can get a discount coupon of same amount or more that you have recharged of (like if you have recharge of `101-150 you will get a discount coupon of `150). Just by using freecharge.in. You can recharge for almost all the telecom service provider. They provide discount coupons of popular retail outlets like Domino’s, Barista Lavazza, Baskin Robbins, McDonald, PVR Cinemas and many more. 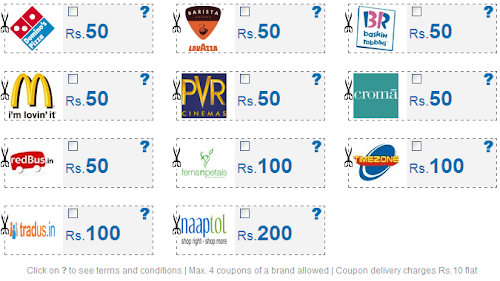 But to redeem your coupon you have to do purchasing of the certain amount (given on the site). They charge `10 extra for Coupon(s) delivery change. However if you don’t want any discount coupon (hope you wants) you can still recharge your mobile phone. 6. Now if you have already recharged from the site then you directly login or you can signup by giving the following details. 8. After going to the next page you can change the coupon shipping address if you don’t want to get your coupon delivered on registered address and select weather you want to pay through Credit Card or Debit Card/Netbanking. 9. Now give the billing and payment details respectively and read everything carefully. 10. After submitting your details wait till it gets to the success page. 11. You will get your mobile recharge instant and you will get your discount coupons within 3-4 working days. Hope you will enjoy it and also let us know what you think about the great concept. Note: It is not a SCAM/SPAM or any such.